Craig and Fiona wanted to explore new ways for humans to care and connect to elephants. The Huxleys scoured the wealth of knowledge of elephant pioneers, charting new ways to appreciate and honor these largest of land mammals. Craig had pursued such quests earlier in his movies with Dr. Jane Goodall and her Wild Chimps. And again with legendary researcher Amy Vedder and her Congo Gorillas. Team Huxley travels on expeditions in search of the newest research, such as vibro-tactile communication. Meaning communication through vibrations in the Earth being felt by elephant feet, traveling across long distances. The Huxleys were filming one of Fiona's music videos in their neighbor’s cactus garden and asked their host where they could find someone with African artifacts. Their neighbor replied, “Why don’t you visit your other neighbor who’s a world famous PhD Environmental Biologist.” Dr. Arnie Newman soon became a crucial part of the team. 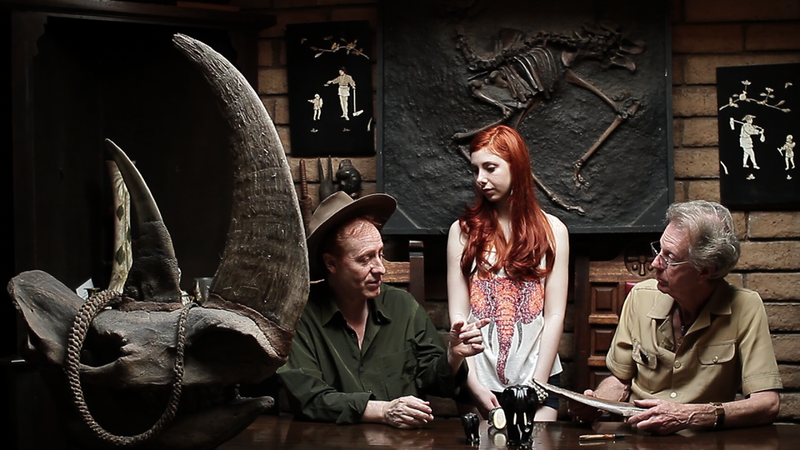 Arnie graciously allowed Craig and Fiona to explore his life’s work of collecting artifacts and pictures from his travels to 80 tropical nations and around the world. Arnie lends a wealth of information about elephants, ecosystems, and human-animal coexistence from his unique insights during his time living in Africa and the Tropical Rainforest. Team Huxley interviewing Dr. Schiffman & Dr. Schroeder at Hogle Zoo where they sample elephant genetics for their cancer research. In early 2016 the Huxleys delved into the groundbreaking research (just published in JAMA) of Utah’s famed pediatric oncologist and his biochemical engineering partner. Re their efforts to potentially cure and prevent human cancers through studying elephant genetics. While in Salt Lake City and Park City during the Sundance Festival, the Huxleys delved into some amazing research being conducted by Dr. Schiffman, a pediatric oncologist. Dr. Schiffman has teamed up with biochemical engineer Dr. Schroeder from Technion in Israel. Their studies have included research of a family whose father, and 3 kids of their 6 kids, have LFS. People with LFS are highly prone to cancer since they carry only one working copy of a cancer-fighting gene than humans normally have two of. Whereas elephants carry 20 times the amount than humans have, and rarely get cancer. Team Huxley with Eric Peterson, Elephant Manager at Hogle Zoo in Salt Lake City, UT. Huxleys participating with elephants and researchers for an answer to cancer. Eric teaching the mahouts in India helpful methods to care for elephants in rehabilitation centers. An elephant whisperer’s 2016 trip to Agra, India, unveiling heartbreaking conditions some Asian elephants live in. And the wonderful work to rehabilitate them. Fiona and Craig wanted to figure out where their might be hope for Asian elephants and new methods to improve their conditions. The Huxleys made a trip in early 2016 to Salt Lake City Zoo to share in depth discussions with the Hogle Zoo elephant manager, Eric Peterson. Just prior to that Eric took a trip to Agra India to rehabilitate Indian elephants. He taught the mahouts (elephant caretakers) in Agra near the Taj Mahal, better methods for elephant care. His dedication to African and Asian elephant conservation is an inspiring tale.